Not sure but I think it was Shinnok, before Raiden had him banished to the Netherrealm. Taven was put to sleep 10000 years ago, when Edenia was still free (but under siege by Shao Kahn's armies). During this time Shinnok was still a Elder God like the others, later on Taven mistakes him for an ally. If the 10000 years number is correct, Shao Kahn invaded Edenia and shortly after Shinnok tried to conquer Earth. Yeah, Taven's timeline doesn't make any sense when Shinnok's first attack and downfall was supposed to have happened in the dinosaur days. No way he should have missed that one unless getting put to sleep a few thousand years messed with his head. It could work out if he actually got put to sleep millions of years ago instead of thousands, in which case Shao Kahn must have been actively conquering realms way back then as well. Which also seems pretty off, since we've never heard of Kitana being alive for millions of years to be taken as a child when he invaded. Plus, when Taven wakes up, if he's so surprised to see Shinnok in the Netherrealm, he should be just as surprised to see Earthrealm teeming with humans instead of Raptor folk. Sadly, Armageddon was... broken. Taven must have been brain-damaged to get any sensible read of the canon, and by any sensible read, Shinnok invaded first by a long, long, loooong shot. It's not even a question worth debating. If Earth had been under siege from Shao Kahn since before Shinnok, then who was even around to fight for it all this time? Were terror birds, entelodons, and saber-toothed tigers fighting for their home world in Mortal Kombat before hominids came along? That would sure be badass, but Kahn's invasion couldn't have been too much older than Great Kung Lao's victory only 500 years ago. The difference between 500 and 65,000,000 years is... a lot. Wut? Onaga was never said to have invaded Earth at any point in history. Even in Deception he didn't "invade" any realms, per se. He just stole their Kamidogu and tried to merge them from the outside. 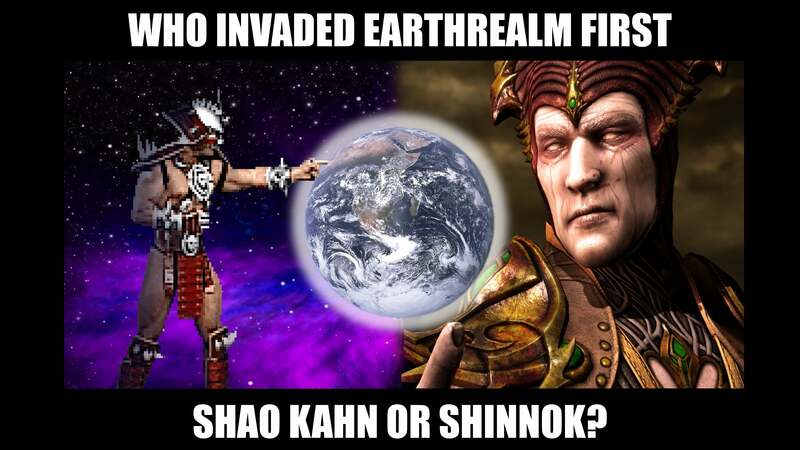 For Earthrealm, I believe it is Shinnok, who either invaded 10000 years ago or millions of years ago, depending on which MK game you use as a source (MK4 states thousands, MKX states millions). 10000 years ago was around when Kahn invaded Edenia, which was some time before he set his sites on Earth. However it is very arguable who started invading realms first. Shinnok is an Elder God so I assume he has been around longer than Kahn, but his first known instance of realm invasion was Earth. If he had invaded before then, the elder gods would have banished him earlier. Kahn, on the other hand, likely took over several other realms before Edenia. Shinnok was never fought during the dinosaur era. Don't where this speculation started. The reptilians are a species of human lizards "evoluted" from dinosaurs. Evolution is a process that requires millions of years to happen. When Raiden fought Shinnok the first time he was aided by humans, who later founded the shaolin. 10000 years is when Shao Kahn invaded edenia (Kitana's age is a good reference) and around the same time Shinnok attacked earth. I thought Shao Kahn first attempt to invaded earth in MK2 and 3.
and before he was just participating to Mortal Kombat tournament. Shao Kahn has had his eyes on Earthrealm for a long time (circa 10,000 years). The MK tournaments weren't just random martial arts tournaments for the fun of it, they were an earnest attempt by Outworld's Emperor to earn the right to lay claim to Earthrealm without interference by the Elder Gods. It's great to see Shinnok and Shao Kahn finally in the same game and it will be awesome to see them cross paths. Reiko and Onaga would be cool, too, but I'm more interesting in seeing how the two big bads (Shinnok and Shao Kahn) play off each other. Hopefully in story mode, but at the very least in the pre-fight dialogues. Johnny exaggerated with the numbers And Midway/NRS has always been inconsistent with the dates. In the manual of MK Sub-zero mythologies it is stated that the humans who helped Raiden against Shinnok swore to protect the Amulet alongside the elemental gods and founded the shaolin order to do so. The dinosaur extinguished 65 millions of years ago, the homo sapiens sapient exists since 300000 years at max. So either Raiden was helped by half apes/half men, or the numbers provided by the NRS guys are noted to take seriously. Yeah, the 65 million years ago timing was confirmed in the video. As was the MKM instruction booklet. Judging from the the developers statements, the death of the dinosaurs thing looks canon. Also, it doesn't actually say in there that Shaolin Monks helped out with that temple right away, but instead that the Raiden appointed four guards (god of wind, earth, water and fire). So, most likely some time passed before Shaolin Monks arrived on the scene.